This (geo)graphic was extracted from a 2007 report by the USGS. Back in 2003, Steve Clemons wrote an Op-Ed in the New York Times suggesting the adoption of the Alaska Permanent Fund (APF) model in Iraq. In the 1970’s, during the construction of the Trans-Alaska Pipeline, the state realized that the new oil leases would produce an enormous windfall. Its citizens set up the Alaska Permanent Fund to manage this income, directing that the revenue be invested, the principal remain untouched and the gains be used for state infrastructure investments. A part of the proceeds was distributed as dividends to every Alaskan. By July 2002, the fund had grown to more than $23.5 billion. Dividend payments to Alaskan families averaged about $8,000 per year. Unfortunately, the Bush Administration did not head Steve’s advice, and Iraq’s oil revenues were not harnessed to achieve such an equitable distribution of Iraqi oil wealth. Moreover, the way that the Iraqi oil infrastructure was ultimately institutionalized ensured that the Sunni, Shia, and Kurdish populations were not happy (see here for a great discussion of the issues that delayed legislation: http://www.cfr.org/publication/13298/why_iraqis_cannot_agree_on_an_oil_law.html), and certainly not “bought-in” to the national strategy. Frankly, the approach the Administration chose could not have gone much worse. Afghanistan, on the other hand, has been thought to be entirely different because it was a country without any real natural resources…until now. 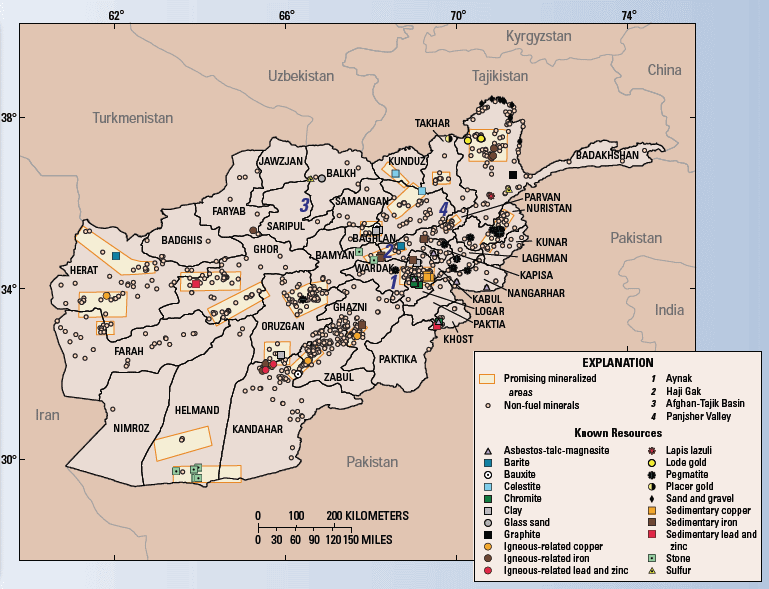 A New York Times article New York Times article recently shined a light on a 2007 report by the US Geological Survey entitled Preliminary Assessment of Non-Fuel Mineral Resources of Afghanistan, 2007. The NYT author, James Risen, indicated that there could be as much as $1Trillion dollars in such mineral assets in Afghanistan. General Stanley McChrystal’s counter-insurgency strategy is premised upon protecting the population, and ensuring a viable economy in Afghanistan. Moreover, there is a huge need for social evolution in Afghanistan, of a kind and scale that can only be brought by an economic and industrial revolution. Perhaps it is time to think about how an Alaska Permanent Fund type mechanism could be established that would allow the exploitation of these resources to actually help Afghans, BEFORE the industrial interests from the US, China, India and Iran tear the country apart, no doubt by strengthening the hands of insurgents and warlords. Free money is actually not difficult to sell to people. But, a real leader will be needed to institutionalize something this bold, in a way that would favor the population over global industrial interests.